The U.S. Department of Agriculture has imposed a $270,000 civil penalty on Feld Entertainment, Inc., the parent company of Ringling Bros. and Barnum & Bailey Circus (“Greatest Show on Earth”), for alleged violations of the Animal Welfare Act spanning a period of years, from June 2007 to August 2011. The civil penalty was made pursuant to a settlement agreement, the largest of its kind in U.S. history, in which Feld Entertainment agreed to “develop and implement annual AWA compliance training for all personnel who work with and handle animals (animal trainer, animal handler, animal attendant, and veterinarian technician).” After March 31, 2012, employees who work with and handle animals would be required to complete the training within 30 days of being hired, and by February 28, 2012, Feld must have established a staffed AWA compliance position. This development is welcome news following recent failures to hold Feld accountable for animal abuses, particularly against elephants. Just this past October, a lawsuit brought by the American Society for the Prevention of Cruelty to Animals and the Animal Protection Institute, alleging violations of the Endangered Species Act, was dismissed in federal appellate court because they lacked standing. It should be noted, however, that Feld does not admit to any wrong doing, stating in a recent editorial that “[w]e stand by our animal-care program” and that the settlement agreement was merely “a business decision” to prevent engaging in “costly and protracted litigation.” Indeed, Feld states it remains firmly committed to two goals: providing for the care and well-being of its animals and producing “the very best in live family entertainment.” In light of documented abuses, and the fact that animals are often forcibly trained via pain to perform tricks, aren’t these goals necessarily in tension with each other? Perhaps if circus-animals were truly happy, truly better off than they would be in the wild, using them for performance purposes wouldn’t be objectionable, but that is not reality. The settlement agreement, one hopes, will encourage compliance with AWA standards, but at the same time it may simply perpetuate the notion that keeping wild animals in captivity for human amusement is acceptable. I would like to put the owners of Feld Entertainement through what they do to the elephants, and then if they survive the torture, blow their brains out! Peru and Bolivia recently banned all wild animal circuses. Most cities in British Columbia did so long ago. It’s time for the rest of North America to catch up. 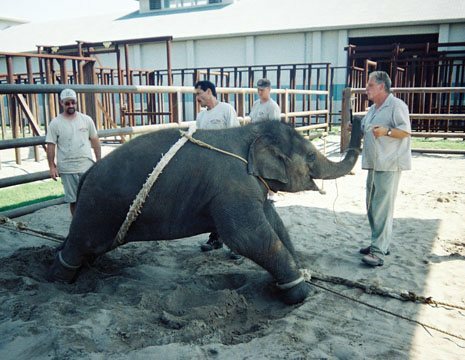 Circuses are an abomination–a relic of the barbaric past. Animals suffer not only continual violence and mistreatment but, what may be worse, relentless confinement in barren spaces. As for these fines, they represent a fraction of a fraction of Feld’s ill-gained earnings, and are a stark example of the futility of trying to regulate a massively profitable, inherently vicious industry. Let 2012 be the year animal circuses are finally consigned to the dustbin of history. Even most welfarists hate circuses. This is an issue around which we can all unite. My personal New Year’s resolution: this will be the year I say goodbye to apathy and become actively engaged, especially to promote achievable objectives. My city of Toronto banned wild animal circuses in the 90’s only to have the ban struck down on a puny technicality. But this victory, while short-lived, set a magnficent precedent by showing what can be done when concerned citizens act together to advance the cause of justice. In this case, the furious opposotion of a Ringling, a corporate mega-giant, was overcome by the sheer force of moral law. Every such triumph adds immeasurably to the strength of the global anti-circus campaign and accelerates the decline of the exploiters. To anyone wishing to start an anti-circus campaign, I would recommend visiting http://www.zoocheck.com and of course http://www.ad-international.org. Spencer, thanks for raising these questions. I believe you’re being diplomatic when you use the word “may” in the final part of your last sentence. Maria, many people probably feel frustrated by the seemingly never-ending institutionalized animal abuse, but your sentiment is not one I espouse. Meeting violence with violence accomplishes nothing but a longer reign of violence. Steady truth-telling, refusal to concede to corrupt practices, and dedicated efforts to abolish unjust systems, accomplished through intelligent actions and fueled by compassion and hope, is, in my view, the only way to effect change. We’ll get there yet; spiritual evolution and its concomitant, moral progress, are going on. Further advancement out of barbarity and injustice and greed is inevitable. I understand Maria’s rage; I am moved by your inspring comments. Your last 2 paragrpahs are worth plagiarizing. Large, wild animals simply aren’t meant for a life of confinement, training to do silly tricks, constant transport and gawking, noisy crowds.